Cabaña 6 is a spacious private one bedroom apartment located only a few steps from the beach and town plaza! 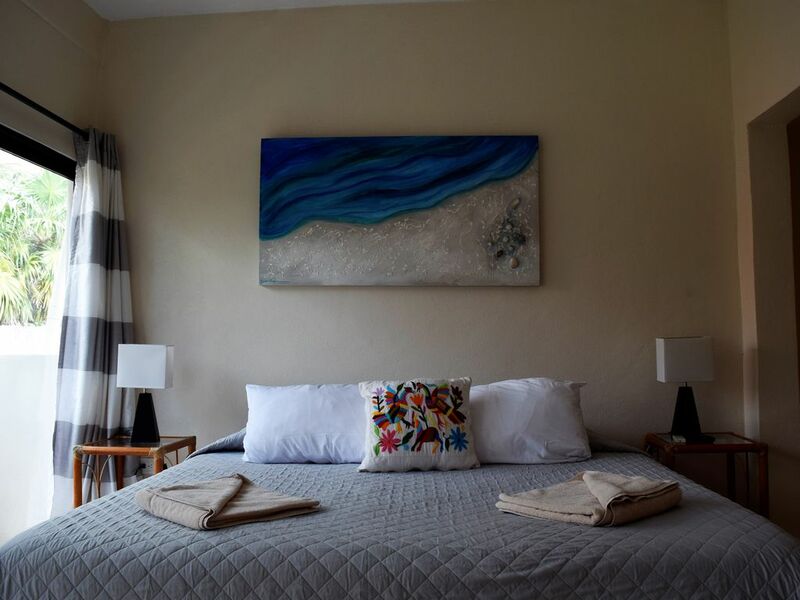 This is one of six units inside Cabañas Puerto Morelos property and located in the most desirable neighborhood - across the street from the best beach in Puerto Morelos and only a 5 minute walk to the center plaza. The modern space includes a fully equipped kitchenette, bathroom, living room and free wifi providing you with all the amenities for a comfortable stay. Our pool is enclosed in a private courtyard filled with palm trees and flowers where you can enjoy swimming, dining or just lounging in a hammock. A true Mexican vacation. Beautiful bath -full kitchen with everything you need. Comfortable bed. Private balcony and rooftop access. Great unit- 1of 6 to share yard and pool. Excellent service from the manager to the housekeepers to the landscaper. The first thing that caught my eye, when we arrived at Cabanas Puerto Morelos, was the beautiful courtyard. After a day of airplanes, bus and taxi it was a welcome sight. We enjoyed every minute of the two weeks we spent here and our stay was enhanced by Kris the manager, Juan the caretaker and Erica who would clean our room every day. If we were to find ourselves in Puerto Morelos again we would definitely stay here....couldn’t imagine staying anywhere else. Perfect location right across from beach, easy and close walk to town. Property management and staff are attentive and reliable. It’s private and safe with a great pool. I will stay there again! Climb the pyramids. Zip through the jungles canopy. Explore the undersea world of a cenote. If you dreamed it, you can do it. Cabañas Puerto Morelos is centrally located to all these activities and more! You can take a day trip and explore the wonders of the Yucatan then return, retreat and relax. -Cenote Azul, one of nature's prettiest swimming pools. -Visit the spectacular ruins and beaches of Tulum. -Discover the secrets of Chichen Itza. -Travel to the Ruins and capture memories of the Maya. -Enjoy the tropical produce at the local farmer's market.